WHERE: Farmstead Arts, 450 King George Road, Basking Ridge, NJ. 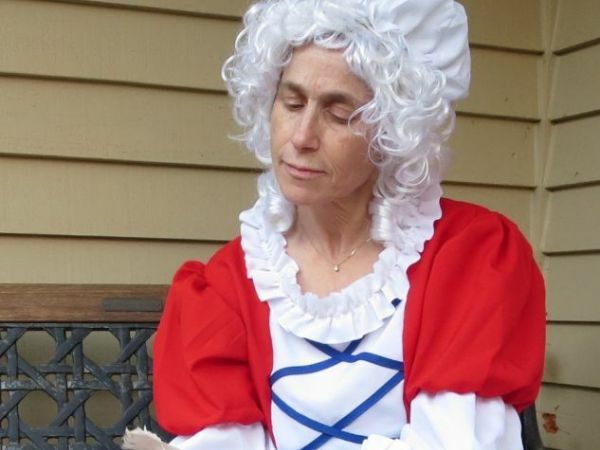 The Farmstead is pleased to welcome Carol Simon Levin as she portrays pioneering female activists and politicians who’ve worked to extend women’s rights, including Abigail Adams who famously wrote to her husband John asking that the Continental Congress “remember the ladies” when drafting new laws for the new nation. Also featured will be both well-known and lesser-known women from Dolly Madison to the Seneca Falls Convention in 1848 and the 1920 passage of the 19th Amendment granting women the right to vote. Carol Simon Levin is a Youth Services Librarian, author, storyteller and Living History Presenter based in Bridgewater N.J. Whether she is impersonating the woman who helped to build the Brooklyn Bridge, telling the amazing stories of early women in aviation, engaging families in a rousing Halloween Hootenany of songs and stories, expanding on the mathematical and artistic possibilities of a simple square, or sharing the story of a dolphin who learned to swim with an artificial, she always strives to create exciting programs that engage her audience’s interests and expand their horizons. The lecture will be held in one f our beautiful galleries in the historic farmhouse at Farmstead Arts. This intimate environment invites the listener into the heart of the narrative, creating an informative and entertaining experience for all. The lecture will be followed by a brief reception, providing an opportunity to meet and talk with the Ms. Levin.